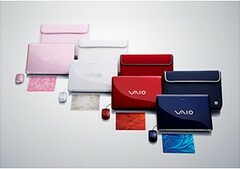 Sony has gone overboard with its latest selection of VAIO notebook PCs, offering 34 choices across six different series. Briefly, these are series C, F, R, S, T, and "TV PC", though as these are initially destined for the Japanese market, I'm gleaning their specifications from a rough translation of the Japanese press release. The VAIO Series C seems to be as much about colour as it is about features, with notebook casing coming in a variety of lush shades including indigo blue, luxury pink, pure white, and an untranslatable shade of red. It seems as if the PC can play back audio and video without having to be fully booted - it certainly has dedicated buttons for multimedia. It also has a built-in 1.3 megapixel webcam, a 14.1-inch widescreen LCD, and is just 2.1cm thick.